Need to see it to believe it? See how Array® can make your meetings more engaging, interactive, and valuable by experiencing the technology live. Capture and keep their attention. Explain the system in 3 minutes or less. Personalize experiences for everyone involved. Amaze people with amusing features. Surprise and excite every participant. Open and maintain a dialogue with everyone involved. Connect everyone with meaningful activities. Foster competitive learning and playful interaction. Built-in analytics deliver all the insight you need to improve live meeting experiences time after time. Capture every thought and action from scoring slides to taking notes. Compare, contrast, and correlate engagement, sentiment, and feedback. 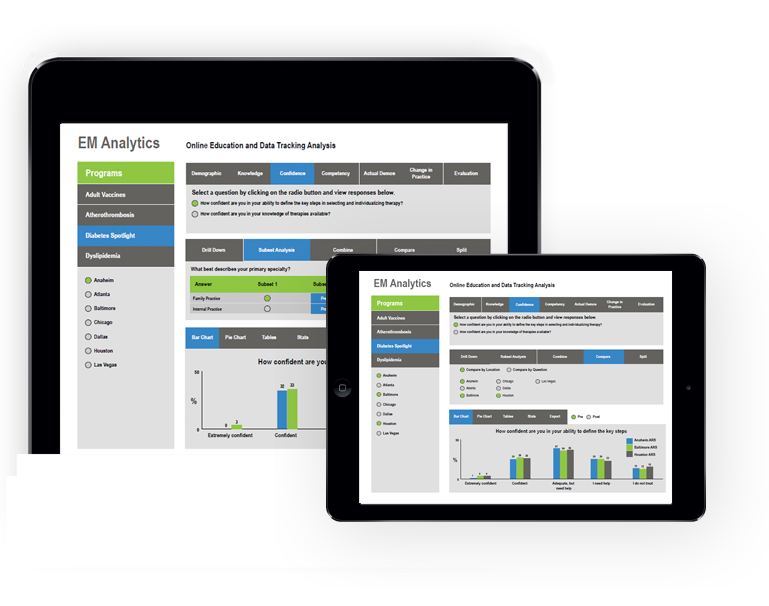 Make data-driven interactive improvements covering major aspects of your meetings. Load content just minutes before your meeting. 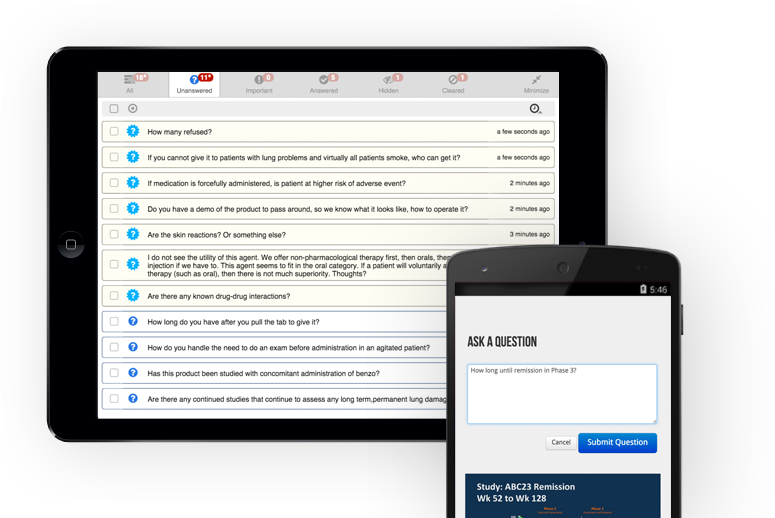 Create new polls or surveys as the meeting unfolds. Notify presenters when engagement levels increase. Connect anywhere on almost any device. 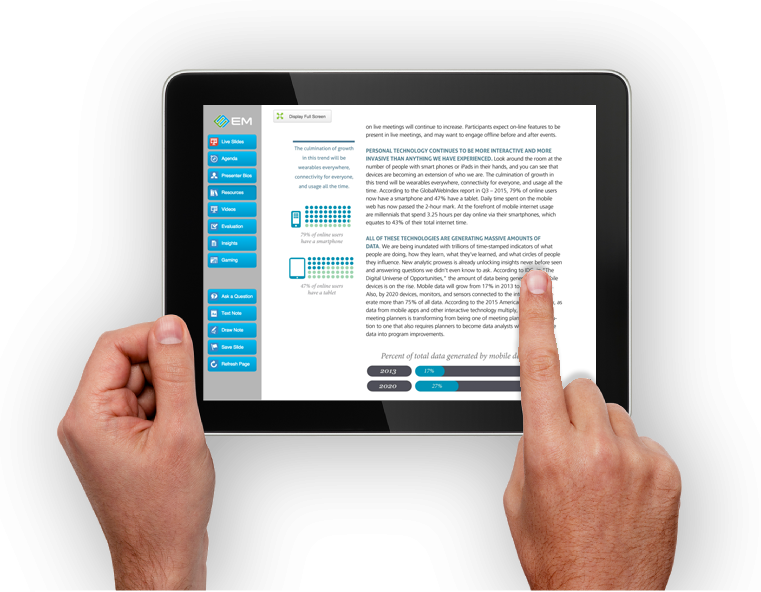 Engage virtual and live audiences in one application. Record and stream live video. Measure audience engagement in all locations. Eliminate travel, lodging, printing and shipping costs. Support virtual and hybrid meetings. Create the ultimate communication environment with our state-of-the-art audio and visual equipment and our top-notch AV services professionals. Automate audience data capture with the latest in audience response system meeting technology, including all data preparation and presentation. Simplify the data collection process with our EM Electronic Survey System and Scannable Forms Services, saving hours of preparation and collection time. Extend the reach of your live meetings with EM Web Streaming Services, provided onsite for your convenience.